Approximately two weeks ago, I had the privilege of visiting a new winery in the DO Alicante called, Bodega Sierra Salinas. A project of the Castaño family winery, Sierra Salinas hopes to produce wines of high quality in an area of Alicante that is truly amazing to visit. Nestled in a rolling valley of hills between the tree lined ridges of the Sierra Salina Mountains, the bodega’s setting is reminiscent of Napa Valley for those California wine lovers. Unfortunately, my trip was short, and to be in such a beautiful place, I was very sad to go. The winery itself was designed by Josè M Abellan, an architect from Yecla. The whole installation was built on the idea of gravity and integration with the surrounding landscape. From the moment the grapes enter the winery until the moment they are bottled, minimal pumping to preserve the essence of the juice extracted from the regional grapes. Currently, they make three wines, all made from Monastrell. In the coming vintages, they will be releasing a “Prestige” wine called, 1237, the name derived from the altitude of the highest point on the property. All of the wines will be offered for export; although, the first vintages to be exported are just now being bottled. Very restrained nose at first this wine really needed time to develop. With about 2 minutes of vigorous swirling in my glass the wine began to reveal shades of wild berries, dark spices, rich chocolate and earthen aromas. WOW, really opens up nicely and I look forward to tasting again with proper decantation. Dark cherry flavors, rich pepper, raspberry, tobacco, and chocolate. Great wine with a bright future. Rich fat nose of vanilla, cherry, wood and raspberries. Somewhat one dimensional at first. In the mouth, the wine really comes alive as the wood fades and fat raspberry flavors mix with a myriad spices. Really a fun wine to drink and though the wood is a bit heavy, I look forward to future vintages. Ryan: Deep cherry red color, with a nose that shows raspberry, rich wood notes, and as it opens black and white pepper. In the mouth, big and rich with strong acidity and tannins with a bit of bitterness on the finish. Well made but still needs some refinement. This wine is DO Alicante. Gabriella: Dark rich deep pomegranate lacking brilliance but made up in color density. This is a bizarre and interesting wine in that the aromas make you doubt the first words that roll of your tongue as you describe the wine: apricots, orange zest, dark plum and spices that remind me of Ethiopian food – which is not a complaint considering it is one of my absolute favorite cuisines. However upon drinking it on the first day…it lost me. The acidity takes over and hides tannin. Not ideal, but on the second day, it relaxed allowing for the cassis, black cherries, ash and chocolate to come alive. Not bad, but not spectacular. While these wines are not yet in the export markets, they will be soon. No one has rated them outside of Spain as of yet (to my knowledge) and therefore, consider this your wake up call to look for these soon to be star wines from an already well known family! One last note, Sierra Salinas has plans in the future to offer a full gamut of tourism options. If you are coming to the region and want a tour of this winery, I HIGHLY recommend visiting them. Only an hour’s drive from the beaches of Alicante, a day spent here would be a journey you would not likely forget. There is no better way to express the beauty of such a place as Sierra Salinas than by Azorin’s well-known novel, which described in the opening chapters the Mediterranean essence evoked by the melancholic landscape. The allure of Bodegas Sierra Salinas is in its enclave; it faces the shaded side of the Sierra Salinas’s mountains near Villena; perhaps one of the most picturesque parts of this landscape. The valley where the winery and the vineyard are settled is of limestone in nature with certain streaks of clay, which combined with the altitude (between 600-680 metres above sea level) and the constant flow of air, makes for perfectly healthy vines; a privileged site to develop great wines. The building which contains the winery is a quiet and peaceful balcony overlooking the vineyard. The wines are born as observers of these amazing surroundings. The Castaño family, soon realized the potential of the Monastrell vineyards in this soil and started this high quality wine project. The estate consists of 85 hectares of land where almond and olive trees share the land with the vineyards. At present, there are 42 hectares of old bush Monastrell vines, the indigenous Mediterranean variety. The remaining hectares devoted to vineyards are planted with three varieties in irrigated trellises; Cabernet Sauvignon, Garnacha Tintorera and Petit Verdot. There is new planting of vines planned for the near future, with the clear purpose of making the best of this poor stony earth on the slopes of the northern side of Sierra Salinas. 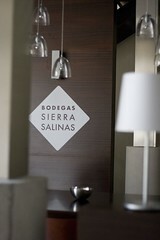 As a young project, Bodegas Sierra Salinas is still seeking its own identity through its ideal terroir and facilities. We aim to make our wines with a unique perspective. Perhaps the place that inspired Azorín’s wonderful stories directs our efforts step by step. The winery is located in an ultra modern building, where both the Castaño family’s 50-years of wine making experience and the latest technological advances come together. Two main premises were taken into account when conceiving and developing its design; thermal isolation and the use of gravity to minimize the harmful effects of oxygen on the wine. Thermal isolation and temperature control has been achieved in the following ways. The winery is located in the centre of the vineyards to avoid the grapes heating up once harvested. The winery protects the vats by being orientated due south into the sun, so that the wine making can be done on the opposite cooler side of the building. The grapes are placed immediately into a large cooling room which drops their temperature down to around 4Ã‚ÂºC – 5Ã‚ÂºC, to maintain the integrity of each berry. Each vat is temperature controlled. Finally, the barrel room is located under ground which ensures a constant cool temperature. Control is the key advantage. The building has been designed using a top down system that takes advantage of gravity to move the wine from one stage to another reducing dramatically the harmful effects of oxygen. The grapes enter the winery on the first and highest floor, where they are vinified. The resulting must is then dropped down to the ground floor where it stabilizes and the press wine is produced. Finally the wine drops down into the cellar where it is barreled and bottle aged. The winery contains “chapeau flotant” split tanks. The top half of the tanks – located on the first floor – is dedicated to cool maceration and alcoholic fermentation. Following our philosophy of respecting the grapes, a modern system called “pigeage” is used. This facilitates the mixing of the cap (skins and seeds) with the must, in a non aggressive way, avoiding the undesirable oxidation that pump-overs can cause. Instead, the technique gently stirs the cap mixing it into the must. The bottom half of the tanks, which are accessed from the ground floor, are used for stabilizing and storing the wines. The press wine which is produced at this stage is produced with the use of bladder presses that reduce over pressing and therefore avoid non-desirable aromas and flavors. The press wine is stored separately and is only used if the wine maker sees fit. This is yet another point of control provided by the technology. In the cellar, 500 French oak barrels – from the Allier region – are used to give the wines their characteristic aromatic notes. The barrels are either medium toasted or medium plus toasted. At no point are the wines filtered. In bottle the wines are aged depending on each wine’s needs. When an ideal block of vineyards was found on the slopes of the mountain range Sierra Salinas in D.O. 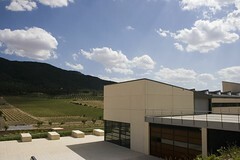 Alicante, the Castaño family didn’t hesitate in recognizing its potential and initiated the building project which has provided such a unique winery. The official inauguration was in September 2006. The high quality produced so far is due to the wealth of experience and knowledge possessed by the Castaño family, and the control that the winery provides over the wine making process.